You'll be £19.99 closer to your next £10.00 credit when you purchase Fighter Aces! The Constable Maxwell Brothers. What's this? Order within the next 3 hours, 55 minutes to get your order processed the next working day! When Gerald Constable Maxwell was flying as a fighter pilot in World War I, his brother Michael was born. Both went on to have distinguished flying careers in World War II. This is the story of both men and how their paths crossed during the second conflict. Gerald served with distinction with 56 Squadron, one of the crack fighter units of WWI in France. Upon his return to England he became Chief Flying Instructor of No. 1 Fighter and Gunnery School at Turnberry. In World War II he served as Station Commander at RAF Ford, a night Fighter station near Arundel, one of the most efficient and happy stations in 11 Group. Michael followed in his brother’s footsteps and joined 56 Squadron in April 1940 to fly the Hawker Hurricane. During May the squadron was moved to France to assist the fast retreating British and French forces as the Germans rapidly advanced. On 27 May, he was shot down whilst attacking ten Heinkel 111s on their way to bomb Dunkirk. Fortunately his first contacts upon landing by parachute were French and he managed to find his way to Ostend where he boarded a trawler and crossed the Channel back to Deal. 56 Squadron had by now returned to their English base at North Weald from where they were flying patrols over the French coast and escorting RAF bombers raiding the German positions. On 8 June, whilst trying to reach returning Blenheims over Le Treport, the Hurricanes were bounced by Bf 109s and again Michael was hit, wounding him in the leg and foot, fortunately he eventually managed a crash landing back at North Weald. During the height of the Battle of Britain Michael was again forced to make a crash landing near Herne Bay which he was lucky to survive as his Hurricane had disintegrated around him. In the autumn of 1941 Michael was posted to 604 Nightfighter Squadron, led by the legendary ‘Cat’s Eyes’ Cunningham flying Beaufighters and eventually Mosquitos. He was eventually to Command the squadron whose tally of enemy aircraft shot down when he left it had reached 100. This remarkable story includes first-hand combat accounts from both Michael and Gerald and the author has had access to the Constable Maxwell’s family records. Alex Revell has written many aviation books and is respected amongst literary community. The author has assembled an absorbing account of two remarkable brothers. What stands out most here is the massive increase in the complexity of aerial warfare in the 20 years between the two world wars. Gerald's war was one of standing patrols over the trenches; battles fought between generally quite similar aircraft, and with a feeling of some detachment from the fighting taking place on the ground. 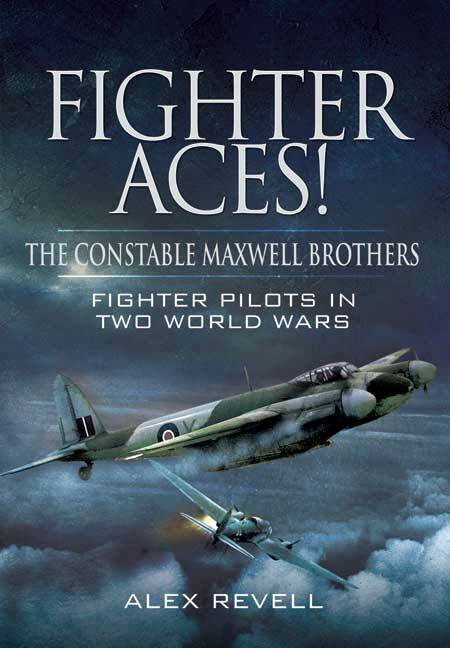 This fast-paced double biography begins with the story of Gerald Constable Maxwell's service in the Great War, predominantly with 56 Squadron, one of whose star pilots he became. The author makes good use of his subject's diary to detail Gerald's hectic life of patrols, combats and victories. The book's cover emphasizes the work's dominantly Second World War content. However, any Great War aviation enthusiast should enjoy the 167 pages about Michael and Gerald in the '39-'45 conflict just as much as they have enjoyed the 62 pages about the earlier war. If The Vivid Air does not already grace your bookshelves you may want to add Fighter Aces to your collection of quality aviation biographies. The prolific output of Pen & Sword in the aviation field continues with biographies of two brothers named Constable Maxwell. Both were distinguished fighter pilots but differed from each other in that Gerald was a pilot in NO.56 Squadron, flying S.E.5A's during the First World War. His official total of victories mounted to 27 plus some that were not confirmed. Michael was 23 years younger than his brother and joined the Oxford University Air Squadron in 1935. He served in the Cameronians until his application for an RAF commission was granted in October 1939. After training at No.9 FTS at Hullavington, he was posted to No. 7 B&Gs at Stormy Sown for advanced training. Being from an aristocratic family with many useful connections, he inevitably arrived in April 1940. at North Weald to join his brother's former squadron, No.56, then flying hurricanes. During May he was flying sorties over Belgium to help cover the evacuation from Dunkerque and was shot down by Bf 109s. He abandoned his aircraft and was just in time to get on to a ship back to base. He then went through the Battle of Britain until posted to an OTU in February 1941. Gerald, in the meantime, had been recalled and became Station Commander at Ford. Michael converted to night fighting at 60 OTU and joined 604 Squadron on October 1941. The rest of his war was twin-engined fighters, beaufighters and mosquitoes. This is an unusual account of two very different brothers in two World Wars.